The Wayne State University Center for Health and Community Impact will host a career development experience for 30 Detroit high school students. The experience is a weeklong series of events that will be held during the Detroit Public Schools Community District mid-winter break, Feb. 18-22, 2019. Throughout the series, students will explore the Wayne State campus, learn how to apply to college and for financial aid, practice community health skills, and potentially earn a Wayne State University scholarship. Detroit high school students in grades 10, 11 and 12 are encouraged to apply for the program. Student teams will be mentored by WSU Community Health faculty, staff and students throughout the week. After being placed in teams, students will tour a Detroit neighborhood and learn about the area from Community Health Pipeline (CHP) partner agencies such as Brightmoor Artisans Collective, CHASS Center, Earthworks Farm, Eastern Market, Fair Food Network and Gleaners Community Food Bank, who are all working in these communities. With the help of their college mentor, students will work together to identify a food-related health problem facing the community that they visited and develop an intervention to address their target population and health problem. Students will create an implementation plan complete with a budget for their intervention. On Friday, Feb. 22, teams will present their interventions to a panel of local experts in food, health, policy and education for the opportunity to earn additional prizes. The career development experience is free, and lunch is provided. Detroit high school students who are interested in participating can apply to the program at tinyurl.com/2019P5YouthApp. The deadline to apply is Jan. 31, 2019. The Wayne State University CHP project is currently finishing its second year of programming. The CHP is directed by Noel Kulik, Ph.D., an assistant professor in the College of Education and a research fellow in the Center for Health and Community Impact. The program works to provide a career development and community health pipeline to support Detroit high school youth to enter college, obtain well-paying jobs, and change the health, economic and social trajectories of their communities. The CHP seeks to formalize relationships among organizations in Detroit, leverage ongoing and existing resources in the city, train youth leaders to address community health problems, support youth in post-secondary opportunities, and address the lack of diversity in the community health field. The program is funded by the Michigan Health Endowment Fund. The CHP includes five pillars — education, experience, apprenticeships, leadership and career development — that build upon each other. The first pillar includes a collaboration between the Center for Health and Community Impact and the Detroit Healthy Youth Initiative and Michigan Harvest of the Month to teach more than 40,000 high school students in four Detroit schools about making healthy food choices. More than 300 students have applied their knowledge of nutrition by using vouchers to purchase local produce. The program also provides paid internships; more than 150 students have gained experience in food production, handling and marketing; community engagement; nutrition education; and programs supporting food security over the past two summers. Additionally, students have the opportunity to learn about university resources, explore community health programs and careers, earn a scholarship to Wayne State, and compete for additional prizes during a week on WSU’s campus. 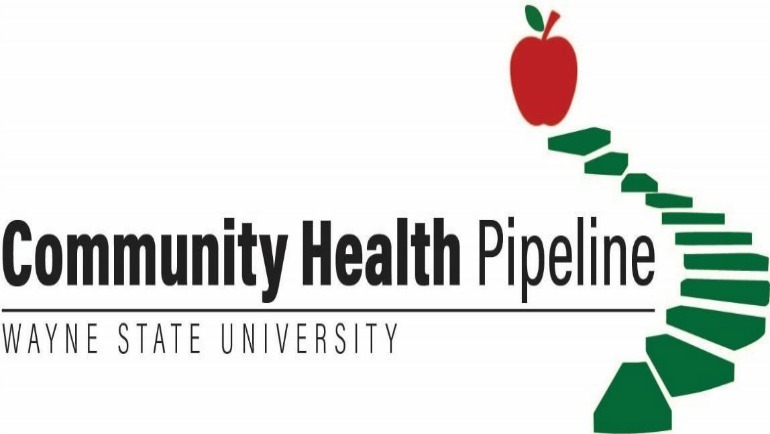 For more information about the Community Health Pipeline, contact Stephanie Osborn, project manager, at 313-577-0390 or CHP@wayne.edu, or visit coe.wayne.edu/centerforhealthandcommunityimpact/community-health-career-pipeline.php. The mission of the Center for Health and Community Impact is to improve community health and vitality through leadership and advancement of research, programs and policies for healthy living. The center works with community partners to develop and lead culturally relevant, evidence-based and sustainable programs that transform the healthy living opportunities for families, neighborhoods and organizations to promote a holistic approach to health and social equity across the lifespan. Through its efforts, educators, clinicians, practitioners, evaluators, researchers and community leaders at Wayne State University advance health and social equity at local, regional and national levels. The center’s programs have directly impacted more than 150,000 youth and families and 500 educators and health practitioners across 350 community organizations. For more information, visit coe.wayne.edu/centerforhealthandcommunityimpact. For more than a century, the Wayne State University College of Education has prepared effective urban educators who are reflective, innovative and committed to diversity. Its Teacher Education Division boasts one of the most comprehensive, well-established programs in the country, and all four academic divisions offer a range of undergraduate and graduate degrees in nearly 30 program areas, including learning design and technology, leadership and policy, kinesiology, sport administration, education evaluation and research, health education and educational psychology, and counseling. To learn more, visit coe.wayne.edu. The Michigan Health Endowment Fund works to improve the health and wellness of Michigan residents and reduce the cost of health care, with a special focus on children and seniors. More information about the Michigan Health Endowment Fund can be found at mhealthfund.com.